Tomorrow is a big day for Android fans! Google is kicking off its biggest annual event and it plans to reveal a bunch of high-end devices that are expected to dominate the tech market for the years to come. The devices that stand out the most are Google’s next-generation Pixel 3 and Pixel 3 XL. However, Google will also reveal two other new devices called the Home Hub and the Pixel slate. With that said, today we are going to check out everything there is to know about Google’s hardware lineup for tomorrow and give Android fans an idea of what to expect. This year Google proved that keeping a secret in the tech industry is basically impossible. The internet is buzzing with leaks about Google’s new smartphones and therefore, we have a pretty good idea of what to expect. The two smartphones will ship with new designs and improved hardware specs when compared to the previous models. In fact, Pixel 3 XL has caused an entire outrage in the Android community with its design. The reason why Android fans are upset with Google when it comes to Pixel 3 XL’s design is the fact that it looks too much like iPhone X. Even though the design is spectacular, Android fans wanted something specific and not an “iPhone X replica”. Pixel 3 XL is a masterpiece in terms of specs. Google has equipped the smartphone with a massive 6.71-inches P-OLED display that features a pixel resolution of 1440 x 2690 and a pixel density of 491ppi. In addition, the smartphone is fueled by Qualcomm’s Snapdragon 845 octa-core CPU that is paired with 6GB of RAM and an Adreno 630 graphics processing unit alongside 64GB/128GB of internal storage space. Leaving Pixel 3 and Pixel 3 XL aside, the second most highly anticipated device that the Android parent is scheduled to reveal tomorrow is the Google Home Hub. This is a smart display that is launching as Google’s response to Amazon Echo Show. Therefore, the Google Home Hub will support all types of smart home functionalities such as taking photos, displaying weather information, playing YouTube videos/music and answering questions. 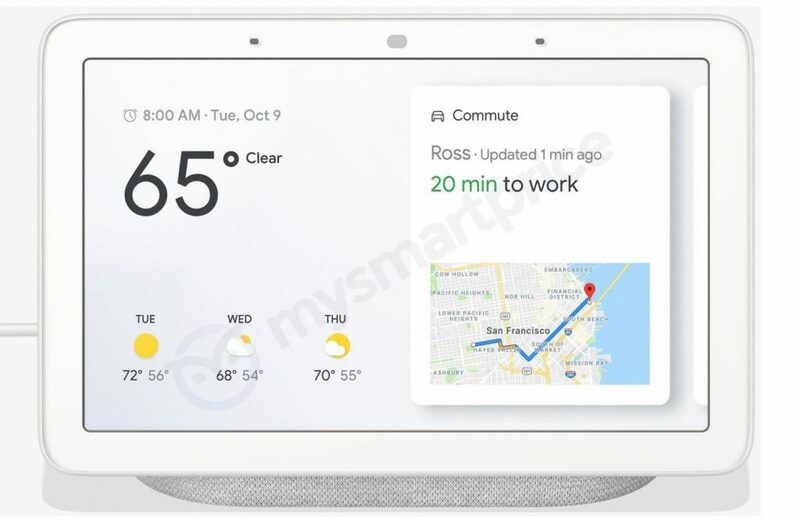 The picture above has been leaked recently and it shows us the design that Google Home Hub will have to offer. This smart display features a sleek design that is paired with a user-friendly UI that makes it easier for Android fans to get the most out of the smart display’s functionalities. Even though Google has yet to confirm anything, the Android parent is expected to reveal a brand-new Chrome OS device tomorrow. Fortunately for us and other Android fans, the device has been leaked (picture above) and we know that it’s called the Pixel Slate. Previous leaks showed that Google is working on a Chrome OS tablet mode dubbed as “Nocturne” and from the looks of it, the real name of “Nocturne” is actually Pixel Slate. One of the highlight features that this Chrome OS device will have to offer is a fingerprint scanner. This is a first in the world of Chrome OS powered devices and it shows us that Google is doing its best to ensure that the Pixel Slate will become a bestselling device. Nonetheless, the Pixel Slate has also been spotted on GeekBench and this is why we know that it is fueled by an eight-generation Intel Core i7-8500Y CPU that ships with 8GB of RAM. The interesting thing about the GeekBench leak is that it showed that the Pixel Slate runs on Android 9.0 Pie, thus leading us to believe that the new Chrome OS update might arrive in the upcoming future and not on launch date.